Many of ITA’s customers believe that access to ITA’s technology is critical to competition in online air travel search because it cannot be matched by other players in the travel search industry. They claim that ITA’s superior access to information and superior technology enables it to provide faster and better results to consumers. As a result, some of these industry participants and independent experts fear that the current high level of competition among online travel agents and metasearch providers could be undermined if Google were to acquire ITA and start its own OTA or metasearch service. If this were to happen, they argue, consumers would lose the benefits of a robustly competitive online air travel market. Here we go again. The European Commission is after Google more formally than a few months ago (but not yet having issued a Statement of Objections). For background on the single-firm antitrust issues surrounding Google I modestly recommend my paper with Josh Wright, Google and the Limits of Antitrust: The Case Against the Antitrust Case Against Google (forthcoming soon in the Harvard Journal of Law & Public Policy, by the way). The allegations of anticompetitive behavior come as Google has acquired a large array of online services in the last couple of years. Since the company holds around three-quarters of the online search and online advertising markets, it is relatively easy to leverage that dominance to promote its other services over the competition. If mobile application advertising competes with other forms of advertising offered by Google, then it represents a small fraction of a larger market and this transaction is competitively insignificant. Moreover, acknowledging that mobile advertising competes with online search advertising does more to expand the size of the relevant market beyond the narrow boundaries it is usually claimed to occupy than it does to increase Google’s share of the combined market (although critics would doubtless argue that the relevant market is still “too concentrated”). If it is a different market, on the other hand, then critics need to make clear how Google’s “dominance” in the “PC-based search advertising market” actually affects the prospects for competition in this one. Merely using the words “leverage” and “dominance” to describe the transaction is hardly sufficient. To the extent that this is just a breathless way of saying Google wants to build its business in a growing market that offers economies of scale and/or scope with its existing business, it’s identifying a feature and not a bug. If instead it’s meant to refer to some sort of anticompetitive tying or “cross-subsidy” (see below), the claim is speculative and unsupported. The Commission will investigate whether Google has abused a dominant market position in online search by allegedly lowering the ranking of unpaid search results of competing services which are specialised in providing users with specific online content such as price comparisons (so-called vertical search services) and by according preferential placement to the results of its own vertical search services in order to shut out competing services. Congressmen working on national intelligence and homeland security either don’t know how to secure their own home Wi-Fi networks (it’s easy!) or don’t understand why they should bother. If you live outside the Beltway, you might think the response to this problem would be to redouble efforts to educate everyone about the importance of personal responsibility for data security, starting with Congressmen and their staffs. But of course those who live inside the Beltway know that the solution isn’t education or self-help but… you guessed it… to excoriate Google for spying on members of Congress (and bigger government, of course)! Consumer Watchdog (which doesn’t actually claim any consumers as members) held a press conference this morning about their latest anti-Google stunt, announced last night on their “Inside Google” blog: CWD drove by five Congressmen’s houses in the DC area last week looking for unencrypted Wi-Fi networks. At Jane Harman’s (D-CA) home, they found two unencrypted networks named “Harmanmbr” and “harmantheater” that suggest the networks are Harman’s. So they sent Harman a letter demanding that she hold hearings on Google’s collection of Wi-Fi data, charging Google with “WiSpying.” This is a classic technopanic and the most craven, cynical kind of tech politics—dressed in the “consumer” mantle. Rewind to mid-May, when Google voluntarily disclosed that the cars it used to build a photographic library of what’s visible from public streets for Google Maps Street View had been unintentionally collecting small amounts of information from unencrypted Wi-Fi hotspots like Harman’s. These hotspots can be accessed by anyone who might drive or walk by with a Wi-Fi device—thus potentially exposing data sent over those networks between, say, a laptop in the kitchen, and the wireless router plugged into the cable modem. I’m a big fan of CNET’s “Buzz Out Loud” podcast and often enjoy co-host Molly Wood’s occasional “Molly Rant” but I’m disappointed to see her jumping on the Google-bashing bandwagon with her latest rant: “Google Buzz: Privacy nightmare.” Instead of appreciating the “privacy by design” features of Buzz, she seems to be rushing to privacy paternalism—just as I feared many would when I blogged about the Buzz launch. Molly’s primary complaint, repeated several times, is that “you automatically follow everyone in your Gmail contact list, and that information is publicly available in your profile, by default, to everyone who visits your profile.” Actually, while Buzz does automatically follow some users your contact list, it does so only for the ones you chat with most using Gmail (which I believe means only other Gmail users). After that, Buzz simply tells you when other users follow you, and makes it easy to follow them. It’s been a busy week in the Googlesphere. Google made headlines earlier this week when it aired a televised ad for the first time in the company’s history, and again yesterday when it unveiled Buzz, its new social networking platform. Today, Google announced bold plans to build an experimental fiber-to-the-home broadband network that’s slated to eventually deliver a whopping gigabit per second of Internet connectivity to 500,000 U.S. homes. Google’s ambitious broadband announcement comes as welcome news for anybody who pines for greater broadband competition and, more broadly, infrastructure wealth creation in America. To date, Google has dabbled in broadband in the form of metro Wi-Fi, but hasn’t embarked on anything of this scale. Laying fiber to residences is not cheap or easy, as Verizon has learned the hard way, and Google will undoubtedly have to devote some serious resources to this experiment if it is to realize its lofty goals. It’s important to remember, however, that Google is first and foremost a content company, not an infrastructure company. Google’s generally awesome products, from search to video to email, attract masses of loyal users. In turn, advertisers flock to Google, spending billions in hopes of reaching its gigantic, precisely-targetable audience. This business model enables Google to invest in developing a steady stream of free services, like Google Voice, Google Apps, and Google Maps Navigation. So it won’t be too surprising if Google’s broadband experiment doesn’t initially generate enough revenue to cover its costs. In fact, I’m skeptical that Google even anticipates its network will ever become a profit center. Rather, chances are Google won’t be at all concerned if its broadband service doesn’t break even as long as it bolsters the Google brand and spurs larger telecom companies to get more aggressive in upgrading their broadband speeds (which, indirectly, benefits Google). Google’s broadband agenda is great news for consumers, of course. Who can complain if Google is willing to invest in building a fiber-to-the-home broadband network and is willing to charge below-cost prices? Not me! Google amasses a goldmine of data by tracking consumers’ behavior as they use its search engine and other online services. Combining this information with information collected by AdMob would give Google a massive amount of consumer data to exploit for its benefit. If Internet regulation follows the same course as other industries, the FCC and/or lawmakers will eventually indulge calls by all sides to bring more providers and technologies “into the regulatory fold.” Clearly, this process has already begun. Even before rules are on the books, the companies that have made America the leader in the Digital Revolution are turning on each other in a dangerous game of brinksmanship, escalating demands for regulation and playing right into the hands of those who want to bring the entire high-tech sector under the thumb of government—under an Orwellian conception of “Internet Freedom” that makes corporations the real Big Brother, and government, our savior. 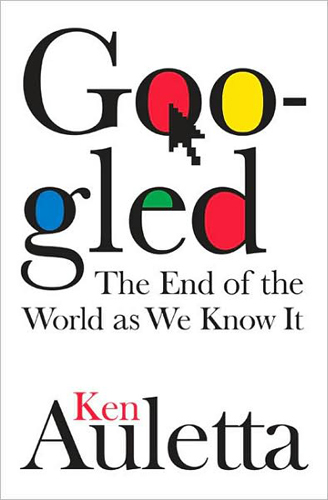 I just finished Ken Auletta’s latest book, Googled: The End of the World As We Know It, and I highly recommend it. Auletta is an amazingly gifted journalist and knows how put together a hell of good story. It helps in this case that he was granted unprecedented access to the Google team and their day-to-day workings at the Googleplex. I’m really shocked by the level of access he was granted to important meetings and officials–over 150 interviews with Googlers, including 11 with CEO Eric Schmidt and several with founders Sergey Brin and Larry Page. That’s impressive. The book shares much in common with Randall Stross’s excellent Planet Google: One Company’s Audacious Plan to Organize Everything We Know, which I reviewed here earlier this year. Both books recount the history of Google from its early origins to present. And both survey a great deal of ground in terms of the challenges that Google faces as it matures and the policy issues that are relevant to the company (privacy, free speech, copyright law, etc). What makes Auletta’s book unique is the way we taps his extensive “old media” world contacts and integrates such a diverse cast of characters into the narrative — Mel Karmazin (former Viacom, now Sirius XM), Bob Iger (Disney), Howard Stringer (Sony), Martin Sorrrell (WPP), Irwin Gotlieb (Group M), and even the Internet’s “inventor”–Al Gore! Auletta interviews them or recounts stories about their interactions with Google to show the growing tensions being created by this disruptive company and its highly disruptive technologies. There are some terrifically entertaining anecdotes in the book, but the bottom line is clear: Google has made a lot of enemies in a very short time. My colleague (and boss) Adam Thierer had a great post last week about how “fart apps” are a great example of the generative nature of the mobile phone application marketplace. But Fart apps are just one type of “soundboard” application. A typical soundboard app has a bunch of buttons, and each time you press a button a sound is played. Most soundboards play catchphrases from popular movies and TV shows. According to AndroidZoom.com, there are 319 applications in the Android Market with “soundboard” in the title or description. Most (280) of them are free. Almost all the free soundboards I tried include advertising from Google. The three main developers of soundboard apps for Android are Androidz , aspidoff, and Raz Corp. Androidz has ads from DoubleClick and aspidoff and Raz Corp (who’s apps seem exactly the same) both have ads from AdMob (which Google recently acquired). I’m all in favor of ad-supported content, but I suspect that the sound clips used in these soundboards are not licensed. My PFF colleagues Berin Szoka and Adam Thierer have written many times about the quid pro quo by which advertising supports free online content and services: somebody must pay for all the supposedly “free” content on the Internet. There is no free lunch! Here are two two recent examples I came across of the quid pro quo being made very apparent to users. Although I use AdBlock on many newspaper websites (because I just can’t focus on the articles with flashing ads next to the text), I would much rather watch a 15-second ad than wait 30 seconds for my show to resume. I think most users would feel the same way. We get annoyed by TV ads because they take up so much of our time. If Wikipedia is to be believed, there’s now an average of 9 minutes of advertisements per half-hour of television. That’s double the amount of advertising that was shown in the 1960s.